If you've put that project away because you're not sure how to finish it, this is the DVD for you. First, get ideas on setting options & border treatments. Next, the quilting really does make it a quilt! 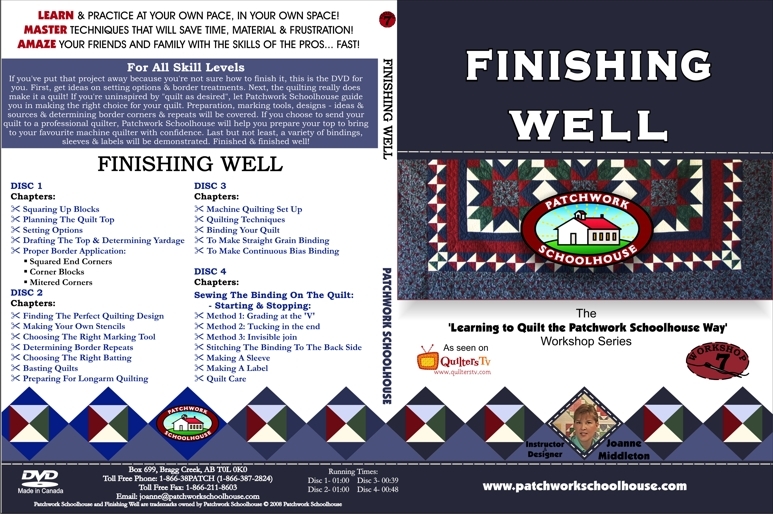 If you're uninspired by "quilt as desired", let Patchwork Schoolhouse guide you in making the right choice for your quilt. Preparation, marking tools, designs - ideas & sources & determining border corners & repeats will be covered. If you choose to send your quilt to a professional quilter, Patchwork Schoolhouse will help you prepare your top to bring to your favourite machine quilter with confidence. Last but not least, a variety of bindings, sleeves & labels will be demonstrated. Finished & finished well!